7 Days of Holiday Party Dresses! Super excited to announce this series! I've been thinking, I love holiday dresses, but I don't need a million more and would love to share with you a collection of wider inspiration ideas. So I asked some of my favorite sewing bloggers to share their holiday dress ideas, and they created and shared some incredible things!! You'll see the inspiration, pattern or patterns, fabric and materials, design tips, and final products of seven lovely dresses! 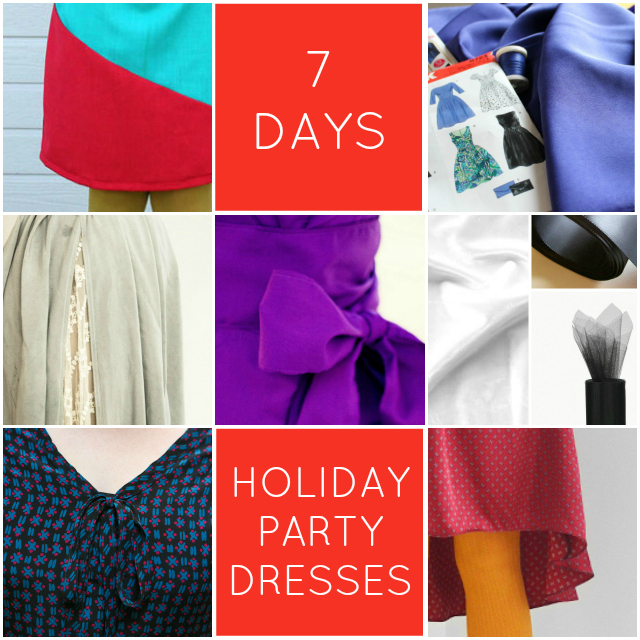 So for the next couple weeks, I'll be sharing seven guest posts from seven great bloggers, to get you ready for sewing some wintery, Christmas or holiday party-ey dresses. Let's do this! So excited to get started! Let's talk holiday party dresses! What a fantastic idea! Looking forward to seeing them all! Saw your home tour on Apartment Therapy and wanted to come over to find out more, especially about the painting above the sofa. Great minds think alike -- I had bought a horribly ugly piece of art at Goodwill about a year ago, but I bought it for the awesome custom gold frame. I recently painted my own abstract art, right over the glass. Makes me want to stop thrift stores more often to look for good frames with ugly art! Thanks for sharing! Good to check out new blogs. Exciting! Can't wait to see.